Wilhelmina Knoche, known as Minnie, was born on 10 August 1869 in Altenilpe, Westfalen, Preussen to Johann and Elizabeth (Voss) Knoche. She was christened on 11 August 1869 in the Catholic church in Dorlar, Westfalen, Preussen. Her godparents were Wilhelmina Berles and August Knoche. 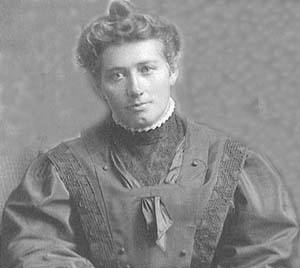 Minnie came to Grand Rapids, MI, when she was 17 having departed from Bremen, arriving in New York 14 Feb 1887 on N.G. Lloyd S.S. Ems. This was at the request of a maternal uncle who had visited Minnie’s parents in Germany, and wanted her to cook for his family. Minnie’s mother thought this would be a chance for her daughter to have a better life and encouraged her to go. By the time Minnie arrived in the United States, after being sick on the voyage, this tiny 5 ft woman only weighed about 80 lbs. Wilhelmina discovered her uncle’s wife "was an ugly terrible person" who, among other demands, wanted breakfast ready every day at 6 a.m. (medical note: she suffered from a very large goiter) A maternal cousin in nearby Westphalia, MI, at the urging of Elizabeth, went to check up on Minnie who pleaded with the cousin to take her away. Not wanting to cause trouble, the cousin advised Minnie to wait a few weeks until the farmers from Westphalia went on their usual first Thursday mill run to get wheat. But the very next Thursday, off Minnie went to the mill with all her things in a bundle. In German, she asked everyone she came across about her cousin and finally found her. The cousin proceeded to get Minnie well and fatten her up again. From there she went on to Detroit to cook for a French family. The love of her life, her Tony, was a grocer in that city. 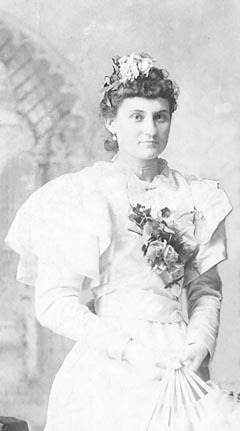 Wilhelmina married Anthony Schulte, son of Anton Schulte and Margaretha Noellecke, in 1890 in Detroit. They had nine sons and two daughters, the youngest born in 1906. Minnie’s brothers, John, Frank and Henry and sister, Bertha, emigrated to the Detroit area later on. Henry died in Detroit in 1914, but the remaining families remained close throughout their lives. In 1907 Tony died of pneumonia. Later that year the old Greiner farmhouse and land, adjacent to Assumption Grotto Church in Detroit, was purchased by Minnie and she moved her family there. There was a vegetable garden and some fruit trees along with two cows for milk and homemade butter and some chickens. At one point Minnie visited with family back in Germany. A distraught relative, who had lost her husband quite some time ago, was comforted but also admonished by Minnie, who had firsthand knowledge of this pain, to pull herself together for the sake of her children. Minnie became an active member of Assumption Grotto parish. She owned one of the first baby grand pianos sold at J.L. Hudson’s and the choir would practice at her home. Minnie and many other parish ladies made quilts for the church bazaars. Every morning she attended Mass and the Stations of the Cross in the afternoon. She looked out for the Sisters: Each Saturday Minnie would make sure to pick out a chicken from her farm for them; and she insisted her boys be available to hitch up the family wagon to drive the Sisters to the convent in Center Line for visits. One German Sister who cooked for the convent liked to stand on the opposite side of the county ditch and chat with Minnie in their native tongue. One Halloween Minnie got the idea to dress herself and her daughter, Lidwina, in the boy’s clothing and add false faces, then went to the convent and mischievously grabbed one of the Sisters and gave her a big hug. After the initial shock subsided, they realized it must be Mrs. Schulte playing one of her jokes. Father Solanus Casey, of the monastery on Mt. Elliott near Minnie's home, knew her well from her attendance at morning Mass. He had counseled her after Tony died, when she was so angry with God for taking such a good man from her at age 49. Minnie was then only 38 with eleven young children. Years later, Minnie was taken to St. Joe's Hospital on the Grand Boulevard because she was so ill with pneumonia. Her daughters, Mary and Lidwina, went to see Father Solanus at the monastery and asked him to pray for their mother. He asked if she read in English or German and Lidwina responded her mother was dying. Father said, "Oh, oh, oh, you take these leaflets, one in English, one in German. Sunday at 1 o'clock she'll be reading it or she won't." That Sunday after Lidwina had fed her family their dinner, she rushed over, wanting to get there by 1 p.m. She arrived at the hospital on May 5th, shortly after that time and saw her sister, Mary, and her Aunt Bertha coming out of her mother's room with their arms around each other, crying and told her that Minnie had died exactly at 1 p.m.
Wilhelmina died at age 65 of bronchial pneumonia, with diabetes and chronic endocarditis as contributory factors. She was buried on 8 May 1935 at Mt. Elliot Cemetery in Detroit. 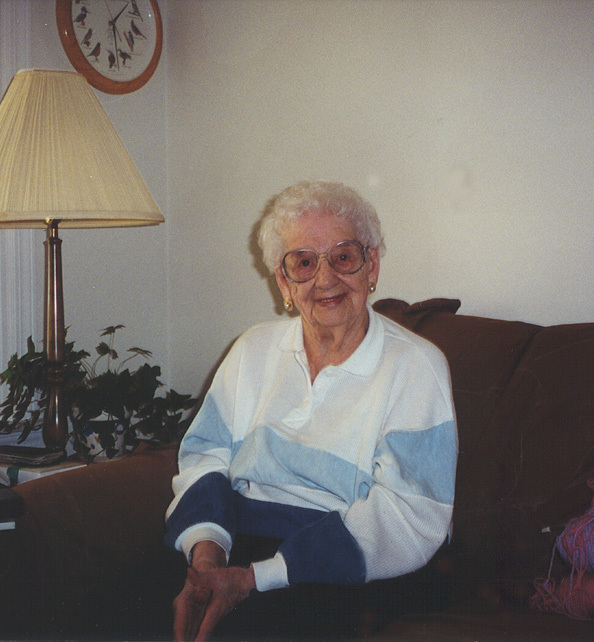 *Lidwina Ann Schulte Geiger contributed many of the memories about her mother. She was the last surviving child in the family. The photo below was taken by Mariana in 2002.